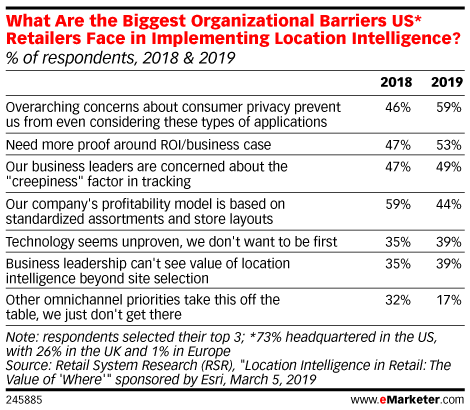 Data is from the March 2019 Retail System Research (RSR) report titled "Location Intelligence in Retail: The Value of 'Where'" sponsored by Esri. 116 retail executives in Europe (1%), the UK (26%) and the US (73%) were surveyed online during December 2018-January 2019. Respondents reported their 2018 revenues as less than $249 million (7%), $250 million-$499 million (20%), $500 million-$999 million (25%), $1 billion-$5 billion (33%) and $5+ billion (16%). Respondents represented retailers who sold in the following product categories: apparel/footwear/accessories (29%), brand managers (2%), FMCG (13%), general merchandise (34%), hard goods (15%) and hospitality/restaurant/retail services/entertainment/other (8%). 38% of the respondents were C-level excutives and 61% were middle management (VP/Director) or senior management (SVP). Esri is a mapping and spatial data analytics technology firm.